Cal Fire officials are urging the public to be cautious about the increased fire danger during Memorial Day weekend. In a statement, Cal Fire officials said that while holiday weekends are a great time to gather and enjoy the outdoors, the public is asked to be aware of fire danger and risks posed in the outdoors. "We urge safety and preparedness when in wildland areas," Cal Fire Director Chief Ken Pimlott said. "California's extremely dry conditions are primed for wildfires, and it takes diligence from everyone to avoid sparking a fire." 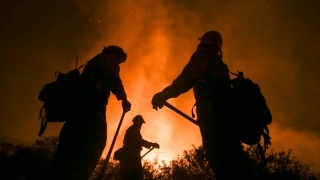 According to fire officials, despite heavy rainfall during the winter season, drought conditions continue across much of California and wildfires can spark easily if caution is not followed. Anyone who is camping is asked to check local fire restrictions in their area, to clear away grass, leaves and other debris within a 10-foot perimeter of any campfire, and to completely extinguish it before leaving. Campers are also reminded not to leave a barbecue grill unattended. Anyone traveling by car is reminded to properly maintain their vehicles, make sure nothing is dragging on the ground and to never drive or pull over onto dry grass. When towing, drivers are urged to make sure trailer chains are properly secured. According to fire officials, since Jan. 1, Cal Fire crews have responded to over 1,000 wildfires that have burned nearly 15,000 acres.